While all eyes are on AMD to announce its next generation Vega architecture, graphics card makers are still coming out with new options based on Polaris. One of those is XFX. Apparently the company is rolling out a new line of Crimson Edition cards, the first of which is the Radeon RX 480 Crimson Edition. As noticed by Fudzilla, the new card sports the same printed circuit board (PCB) design as XFX's Radeon RX 480 Double Dissipation graphics card, but with XFX's logo on top and detachable LED "Red Hard Swap" fans. "Fans are an essential function of a graphics card and directly affect its performance. 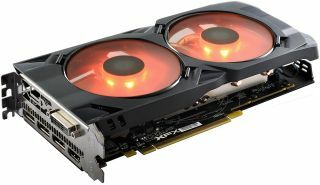 Even though we use the best fans on the market its performance will decrease over time," XFX says. "In the past it was difficult if not impossible to replace GPU fans on your own but now with XFX's Hard Swap technology, you can upgrade your fan in an instant. We even offer different upgrade options for higher performance or color LED options for customization." It's a weird marketing position for XFX to take, saying that its fans will deteriorate and eventually need replaced. That hasn't really been a problem in our experience—certainly not the norm, anyway. We're not saying that fans on graphics cards last forever, but for the most part, we upgrade to something newer and faster long before that becomes a concern. Perhaps more useful is having two BIOSes. XFX's new card allows users to choose between a BIOS configured for high performance and one that is tuned for quieter operation. The Crimson Edition card's GPU operates at 1,120MHz base and 1,288MHz boost. It also has 8GB of GDDR5 memory clocked at 8,000MHz on a 256-bit bus, a single 8-pin PCIe power connector, three DisplayPorts, a DVI port, and HDMI 2.0b output. XFX did not say how much the card will cost or when it will be available.